Do you do a lot of paperwork? The biggest mistake I see, amongst professions, such as lawyers, where there is still a lot of paperwork and reading, is the positioning of their paperwork on the desk! Nearly everyone I see, who needs to read and edit from paper documents, puts these in front of their keyboard. You will then extend your arms forward to type, bringing the shoulders forward, further building up tension in our shoulders and upper back. If you carry on this way for hours at a time, days, weeks and months will quickly pass with you repeatedly adopting this position and back pain will creep up on you. 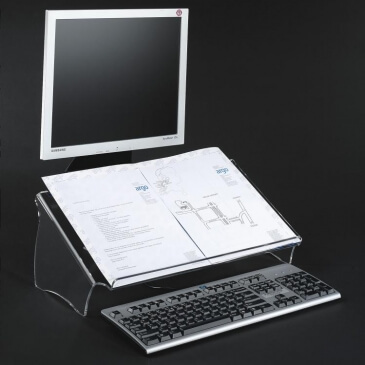 Instead of placing the paperwork at the front of your desk, pushing your keyboard away, place it between the keyboard and screen on a document holder, as per the image below. b. You can pull the holder forward, over the keyboard, when you need to make notes on the paperwork, pushing it back to then type. With your back more supported, muscle tension in your shoulders, neck, upper and lower back should ease. Receive all our latest news and offers as well as tips for improving your posture and working environment.